Later, the Washington Post changed the paragraph further. “The Permanent Mission of the United States to the United Nations and Other International Organizations in Geneva last month released a report saying said last month that that no more than 250,000 Americans are in ‘extreme poverty,’ And U.S. Ambassador to the United Nations Nikki Haley last month denounced a United Nations report saying 18.5 million Americans suffer extreme impoverishment,” read the story as of Sunday morning. Washington Post editors did not add a correction note to the story until hours after Haley called out Stein and Jan on Twitter. “Correction: An earlier version of this story misattributed a statement to Nikki Haley, U.S. 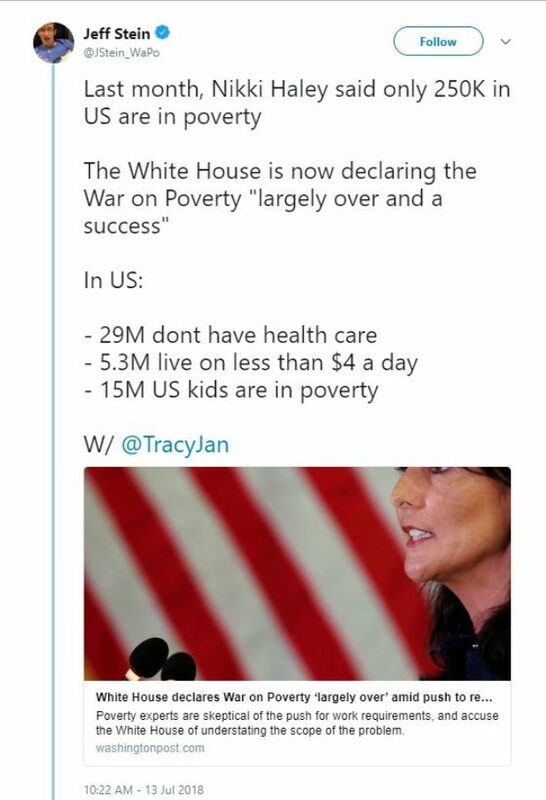 Ambassador to the United Nations, that no more than 250,000 Americans are in ‘extreme poverty,'” said the correction notice. Hours after Haley’s tweet on Saturday, Stein, a former Vox reporter, deleted the incorrect tweet. “I’ve deleted earlier tweets indicating that Nikki Haley, U.S. Ambassador to the U.N., had said only 250,000 Americans are in ‘extreme poverty.’ The U.S. Permanent Mission to the United Nations and International Organizations in Geneva had said this,” he wrote on Twitter after deleting his controversial tweet. A photo of Haley speaking is the photo that appears in social media links to the story.